The ancient manuscripts talk about a Leviathan, a huge creature lying on the silt bed of the lagoon on whose back the city has its foundations. All manuscripts agree on its eternal sleep and they all tell that the beast will wake up one day, shaking the city from its muddy roots, smashing the vitrified stilts on which the city stands, and crashing it into the seething sea where the monster will rise. The ancients say, however, that there will be signs; it is written that the Venetians will feel the tremors, that they would therefore save themselves from the monster, who will recover his freedom by plunging into the waves a deserted city. But there were no signs. What ancients did not know is that the Leviathan is not alive. 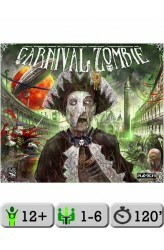 For centuries, the city lived and prospered on the back of .. Following the victory in the Conflict of Autumn, The Regime of Winter has clutched the Land of Fairy Tales in its cold grasp. Fuelled by hate and fear, Winter aims at extinguishing the flame of Love and the light of Hope under a blanket of snow and the never-ending chill of a winter night. In the winding alleys and the small houses desperately clinging to the hillside of Wintertown, frightened Tales move in the shadows, knowing they cannot allow all Hope for the future to be snuffed out by the cold and ready to fight to drive Winter away and let Spring come again. 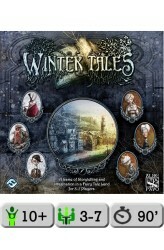 In Winter Tales, a storytelling board game, players tell the tale of the conflict between the characters of fairy tales, who represent all that is good and hopeful, and the Soldiers of Winter, who incarnate evil and the fi..